Labrador City in eastern Canada is about as remote as it gets. This 7,000-strong mining community is surrounded by mountains, forests and lakes, with its nearest neighbour, the town of Baie-Comeau, an eight-hour drive away. In winter – which lasts for eight months of the year – temperatures drop below -30C and snow settles two metres high. With the country’s vast land mass, a significant proportion of Canadians live in far-flung areas such Labrador City – making door-to-door mail deliveries a particular problem for postal authorities, and particularly expensive. In an attempt to cut costs, Canada Post has announced plans to scrap all home deliveries, making Canada the first country in the G20 to be without a door-to-door service. Once the cuts are implemented, only some business addresses will get post through the letter box – not even residents of cities such as Vancouver, Toronto and Montreal will receive mail at home. Already a significant proportion of Canadians have to collect their post from communal collection points, often quite far from their homes in parks or on the streets. Beginning this autumn, Canada Post will roll out a five-year plan to institute community mailboxes across the country. The company says the reforms, which include a hike in the price of a stamp and the shedding of 8,000 jobs, are necessary because email is taking over from letters as a way to communicate. Yet some aspects of its businesses are on the rise, as online shopping has lead to a dramatic increase in parcel mail delivery. Even before the cuts, Canada Post, a self-funding crown corporation, is still reporting huge profits. The company says the community mail boxes are more convenient for the delivery of large parcels that cannot fit through letter boxes. But critics say they can be hard to access, particularly for the elderly or disabled, and especially during winter. The boxes have also been known to become magnets for thieves and vandals. The boss of Canada Post, Deepak Chopra, defended the move, saying the boxes would give senior citizens some exercise. “Seniors are telling me that ‘I want to be healthy, I want to be active in my life,'” Chopra said, brushing off the criticisms. His comments angered older Canadians, including elderly rights advocate Bill Van Gorder “It’s putting another pressure on our older citizens who are trying very hard to stay in their own homes,” said Van Gorder, 71. Susan Dixon, the mother of a young son with cerebral palsy, launched a change.org petition against the move that has so far garnered over 140,000 signatures. Dixon has challenged Canada Post bosses to spend a week in a wheelchair – and pick up their mail from community boxes. The cuts have also been condemned by Canada’s opposition parties, who say there was not sufficient consultation, and the mayors of Canada’s biggest cities. 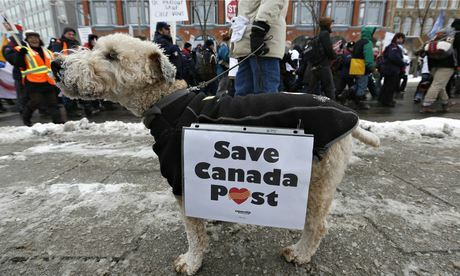 Postal union chief Denis Lemelin said that “to cut, cut and cut” was not the way to reform the postal service, describing the cancellation of home delivery in Canada as the end of an era. Labrador City’s mayor, Karen Oldford, expressed concerns that even if elderly and disabled people can get to the outdoor mail boxes, they will need to battle through the snow. Oldford said using email as an excuse to cancel home deliveries in remote areas was nonsense. “There is still no broadband access in our communities,” she said.